Romania is in the middle of a church-building boom, with some 10 new places of worship completed every month, and one vast cathedral slowly taking shape. But some Romanians take issue with the expense, in one of Europe’s poorest countries – and particularly the use of funds from the public purse. To travel across the north of Romania from Suceava to Maramures is to be bamboozled by exquisite religious eye candy. Everywhere you look there are churches – big, small, medieval, brand new, tin-roofed, wooden, painted – each has its own appeal. What is particularly striking as you bump along the potholed roads that link them, are their sheer numbers. Since the 1989 revolution the Orthodox Church has been going great guns in Romania. The vast majority of the population – nearly 90% – are Orthodox, and in the wake of Ceausescu’s downfall the Church has capitalised on its pre-eminent position in the country, building new churches at a rate of one every three days, including an enormous cathedral currently under construction in the centre of Bucharest. On completion, the plan is that the Cathedral for the People’s Salvation will be the tallest religious building in south-eastern Europe and tower over its immediate neighbour – ex-Dictator Nicolae Ceausescu’s enormous Palace of the People. Romania is undoubtedly a very spiritual country, with religious rituals, icons and celebrations forming the fabric of many people’s lives – on the Saints’ Day of Constantin and Elena in Maramures I witnessed the congregation spill out of two local churches on to the surrounding hillside. However questions are increasingly being asked about the funding of the new cathedral and the Orthodox Church more generally, much of which comes from the cash-strapped state. 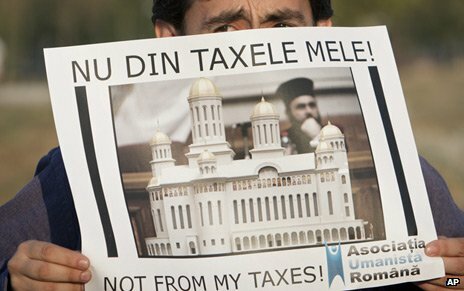 Recipient of an IMF bailout in 2009 and one of the poorest countries in the EU, Romania gives millions of euros to the Orthodox Church every year. From central government funds the church receives more than 100 million euros for priests’ salaries, and many more millions for the construction and renovation of church buildings. Funds also flow in from local councils, city mayors, state companies and the parishioners themselves – though I found no-one who could confirm exactly how much money the Orthodox Church receives each year in total. Remus, who is proposing a bill to change the way the church is funded, believes the close financial relationship between church and state is part of a bigger problem. “In many cases politicians give public funds to churches and in exchange the priests support them in electoral campaigns. Often you see the construction companies who build the churches owned by people who are very close to the politicians. So it’s a kind of circle of money,” he says. 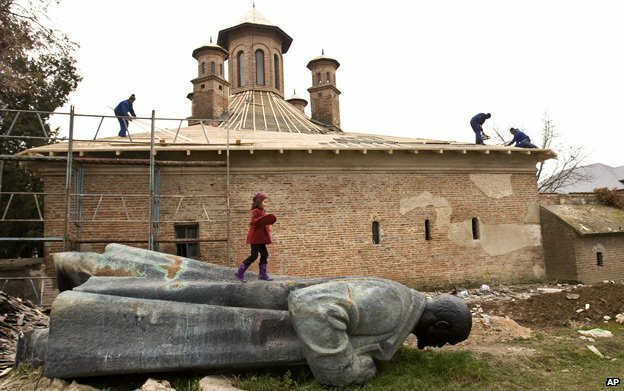 Both the current growth of the church in Romania and the Orthodox hierarchy’s close relationship with the political classes are partly explained by the punitive effects of Ceausescu’s extreme regime when dozens of historic churches were destroyed and many Orthodox leaders collaborated with the communists in order to survive. “Many people were simply forced out of religion during communist times, so in a sense it was natural to return,” says Liviu Andreescu, a scholar of church-state relations. The collaboration between many church leaders and the communists helped perpetuate “the strong sense of co-operation between church and state that we see today, with many religious activities funded by the state”, he argues. Romania’s Minister of Religious Affairs, Victor Opaschi, concedes that there is a close working relationship between the church and politicians during electoral campaigns, and that this is “not a good thing”. Priests also receive money from their congregations, often entering parishioners’ houses to ask for donations. When Orthodox priest Casian Pandelica refused a bishop’s request to raise 50,000 euros for church refurbishment from his 800-strong parish in the village of Reviga, a stand-off ensued, culminating in an aggressive dawn police raid that he believes was instigated by the church hierarchy. Expelled from the Orthodox Church but supported by his local community, he now holds services in a makeshift chapel. Inevitably perhaps, Pandelica is deeply suspicious of the church’s financial motivations, says it does little good work in the community and even suspects church leaders of corruption. In remote Moldavia, famous for its exquisite painted monasteries, I met the only member of the Orthodox hierarchy who would speak to me, Archbishop Pimen. An old man with wise blue eyes and a twinkly smile Pimen is renowned throughout Romania for his spirituality. However, as the Patriarch asks for yet more money for the new cathedral, increasing numbers believe that the cost of church construction is too high. Nearly all the young people I spoke to, especially in the capital Bucharest were not regular churchgoers, and felt the money would be better spent elsewhere. But for the time being, the scene in Maramures on the Saints’ Day of Constantin and Elena is a reminder that the Orthodox religion in Romania remains a vital component of many people’s lives. Its pre-eminent position in society is undeniable. Parishioner Elena, who was celebrating her name day in traditional costume, invited me back to her modest family home where icons hung in every corner.